Pretzel croissants at The City Bakery. NEW YORK — Union Square is one of those Manhattan neighborhoods that offer such plentiful and varied dining options you could be here for weeks and still not get to all of them. Within a handful of blocks surrounding the park, which runs from 14th to 17th streets between Union Square West (Broadway/University Place) and Union Square East (Park Avenue South), you can satisfy almost any food craving. The robust greenmarket, open four days a week year-round, is the big attraction in the square, but don’t miss the bounty surrounding it. A good place to start is at Murray’s Bagels, where you can find the much-talked-about New York style bagels, smoked fish and spreads, and breakfast sandwiches. Choose from 15 bagel varieties and sip a cup of environmentally and socially sustainable Counter Culture Coffee. 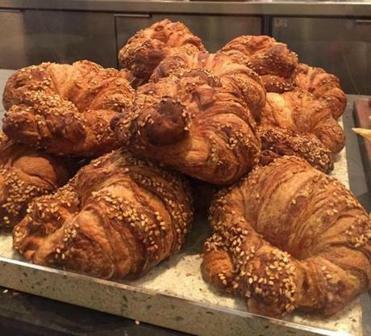 If you wake up with a sweet tooth, head to Breads Bakery for decadently rich chocolate babka, rugelach, and croissants. The City Bakery, another good choice for morning pastries, offers the knobby-looking Baker’s muffin, which isn’t really a muffin (it’s like a cousin of monkey bread), and the lightly salted pretzel croissant. 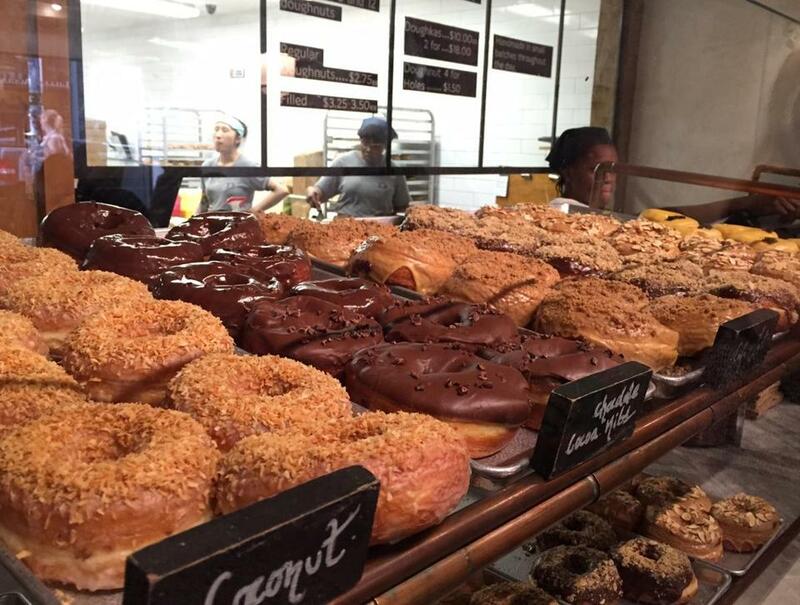 For light-as-air glazed yeast doughnuts, stop in at the popular Dough, where flavors, such as chocolate salted caramel, dulce de leche, hibiscus, and toasted coconut, are baked all day. At lunchtime, pick a cuisine, and you’re likely to find it nearby. If you’ve got a yen for Asian noodles, rice dishes, and slurp-worthy soups, duck into Republic, a cavernous eatery where diners sit on benches at large communal tables. Rainbow Falafel & Shawarma, a tiny spot with no seating, makes falafel, chicken shawarma, and other Middle Eastern dishes; grab yours and eat alfresco in the nearby park. Another picnic-style option is Bedford Cheese Shop on Irving Place for cheeses, bread, salumi, and sandwiches. Diagonally across the street is Casa Mono, the Spanish tapas hole-in-the-wall co-owned by Mario Batali, serving small plates at lunch and dinner. For Cambodian-style sandwiches, such as pulled pork, peppercorn catfish, and ginger barbecue brisket, go to Num Pang Sandwich Shop, the first of this popular eatery’s six locations. For a bit more comfort and stylish ambience, try either ABC Kitchen or ABC Cocina. Furnishings rule in the six-story ABC Carpet & Home store, but Jean-Georges Vongerichten had the foresight to open two restaurants on the first floor. Neither is inexpensive and the food is thoughtfully prepared. Just a skip away is Tarallucci e Vino, a nice spot for salads, antipasti, fresh pastas, and panini. 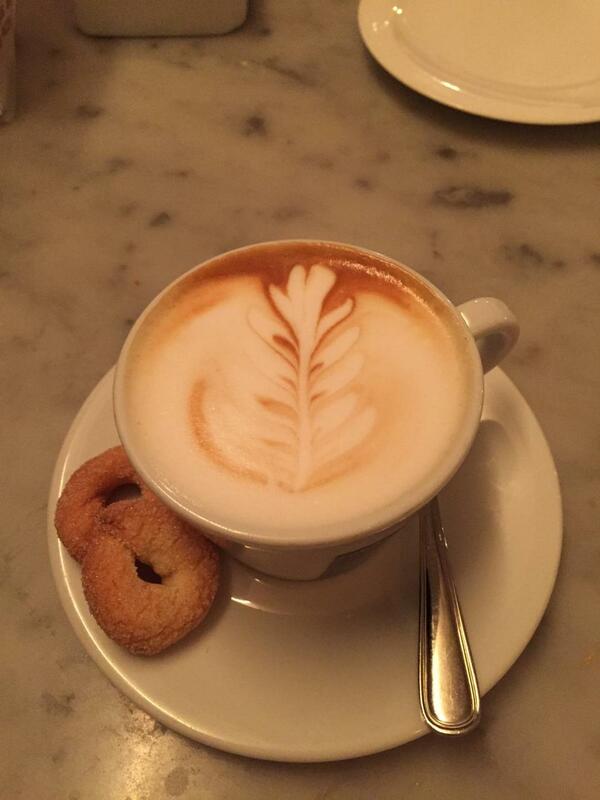 The small ring-shaped tarallucci cookies with a subtle anise flavor are perfect with cappuccino. One of the oldest dining destinations in the neighborhood (and most beloved) is Union Square Cafe, opened in 1985 and closing in December. Restaurateur Danny Meyer is reportedly moving the cafe a few blocks away to Park Avenue South and 19th Street. To top off your meal, try the refreshing soft-serve fruit purees (just fruit, water, and a touch of sugar), served in cups or crisp pretzel cones, at Chloe’s Soft Serve Fruit Co. Also nearby is Amorino, the European chain (with a location on Newbury Street in Boston) that makes luscious gelato and sorbet. A cappuccino and tarallucci cookies at Tarallucci e Vino. Anglophiles, tea lovers, and homesick Brits should walk the few blocks to Tea & Sympathy, a 25-year-old restaurant owned by London native Nicky Perry. She serves traditional English fare for lunch, dinner, and afternoon tea, and breakfast on weekends. “The idea was to have tea that was drinkable,” she says. Next door, her little shop is crammed floor-to-ceiling with British and Irish teas, biscuits, candies, chocolates, jams, sauces, and teapots. And next door to that is Perry’s third spot, A Salt & Battery, which serves up authentic British fish and chips. Chef Mat Arnfield, who hails from northwestern England, beat Bobby Flay in a fish-and-chips throwdown in 2007. Even the desserts — chocolate bars, bananas, and pineapple — are battered and fried. OK, it’s time to venture into the renowned Union SquareGreenmarket, where shoppers include chefs, neighbors, folks from uptown, downtown, and out-of-town. Come armed with cloth sacks and walk up the market from 14th to 17th, then turn east and peruse the stands along 17th. Don’t get loaded down too soon — you can always backtrack — as there are good pickings throughout. All the fare — microgreens and herbs, root vegetables, produce, fruits, grass-fed meats, dairy, jams, syrups, honey, and baked goods come from farmers or producers within 200 miles. You’ll find crusty breads from She Wolf Bakery, Bread Alone, and Rock Hill Bakehouse, and super-crisp pretzels from Martin’s Pretzels (including bags of broken pieces). You can also collect seasonal recipes, watch a cooking demo, get menu planning and shopping assistance, and even drop off food scraps to be composted. The market and the neighborhood offer limitless good eating. You might find yourself zigzagging across the square to get to a new favorite spot.